AURORA pedal straps V2 – Olympic Edition! Cycling > AURORA pedal straps V2 – Olympic Edition! The Olympic Games 2012 in London will start in two weeks. 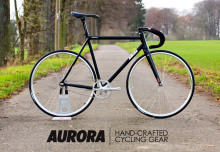 The German Track Cyclists will go for Gold there and of course they will be riding with AURORA Straps. They’ve tested them over the last two years and won several Championships and Medals. Now they take them to London! This is a great honor for me and underlines the quality of the gear I’m producing. To spread the olympic idea and in honor of the 5 colors, I made those special AURORA V2 Straps – Olympic Edition. These will just be available during the Olympic Games. Head over to the AURORA webshop and get your pair.